MKs from Shas, United Torah Jewry, Meretz, and Labor all signed on to a letter of support sent by Labor Party MK Eitan Cabel to U.S. 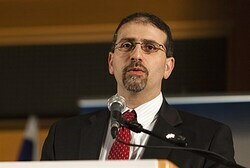 Ambassador to Israel Dan Shapiro. The letter expresses support for the efforts of the U.S. to negotiate a peace deal between Israel and the Palestinian Authority. Among the signers of the letter were Labor Party head Yitzchak Herzog, Meretz head Zehava Gal-on, Shas leader Aryeh Deri, UTJ’s Moshe Gafni, and MKs Amram Mitzna, Meir Sheetrit, and Ofer Shelach. The letter was sent after the Knesset’s Land of Israel Lobby issued an apology to Shapiro, a report on Channel 2 said, after MKs met with Shapiro and sharply questioned him on whether Israel could trust any deal Secretary of State John Kerry produced. At the meeting, Shapiro presented some of the ideas Kerry was likely to offer in the final version of his peace framework, which is still being developed. MKs, including Orit Struk, David Rotem, Nissim Slomiansky, and others questioned Kerry’s ability to deliver on promises he would make in the name of PA chief Mahmoud Abbas. According to Channel 2, Shapiro was said to be “disappointed” with the results of the meeting. On Wednesday, Struk reportedly called Shapiro and apologized for the fact that the story had been leaked to the media.